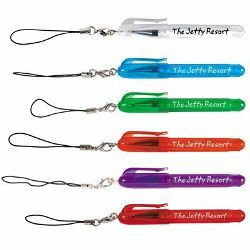 Attaches to most lanyards & mobile phones. ITEM SIZE(MM) 83L x 9Dia (not including cord). PRINT AREA(MM) Pad - 32L x 5H., Roll - 30L x 19H. COLOURS Red, Clear, Blue, Purple, Orange, Green.